I first made this card in the in colours of a few years ago, Blackberry Bliss and Mossy Meadow. I have recreated them in the new in colours that are released in the new catalogue on June 1st 2017, Fresh Fig (my new favourite) and Tranquil Tide. Extra thick Whisper White for card base. Half an A4 sheet scored in half. Remember when stamping with Whisper White that it is pigment ink so takes longer to dry. 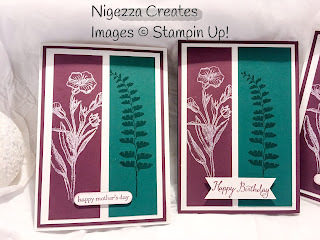 Tranquil Tide panel was stamped with fern stamp in Tranquil Tides ink. Panels stuck to Whisper White mat, this was stuck to Fresh Fig panel ad this was stuck to card base - simples! For any of the supplies to make this project please visit my shop. 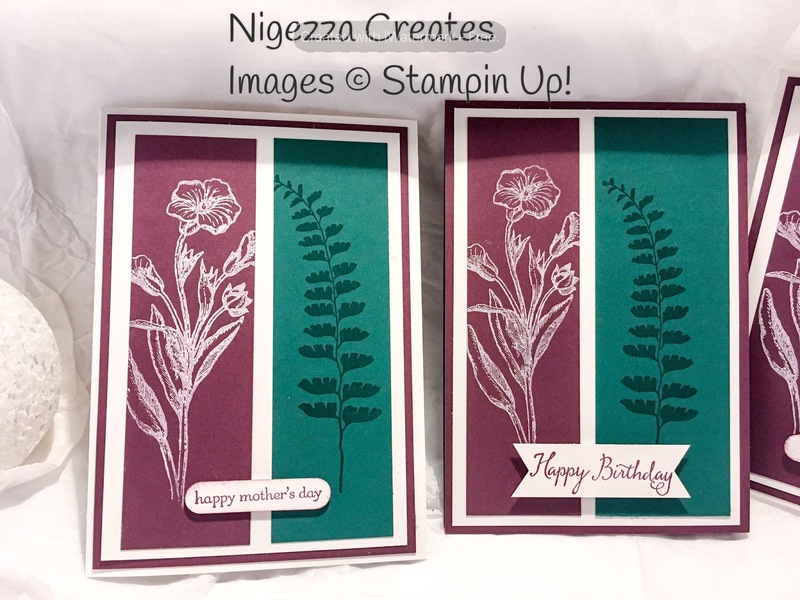 Why not try it in different colours or different stamps.